As you will see by the end of this post, I have recently developed a bit of a back-log of finished projects that I haven’t posted about. For the last couple months I’ve been madly sewing away whenever I have a spare 10 minutes (yes, it is possible to sew garments in 10 minute chunks!) in hopes of having some fresh handmade clothes to wear during out trip to the US. I’ll be meeting lots of sewers and fabric store staff who I know will ask the big question, “So, did you make what you’re wearing?” Since I’ve spent the last year mainly sewing menswear, my handmade wardrobe has become a little tired and frayed around the edges. But I’ve taken a small step to fix this and, since this is the last Friday before we leave to the states (we leave next Wednesday!) there is no better time than now to show you what I’ve finished! 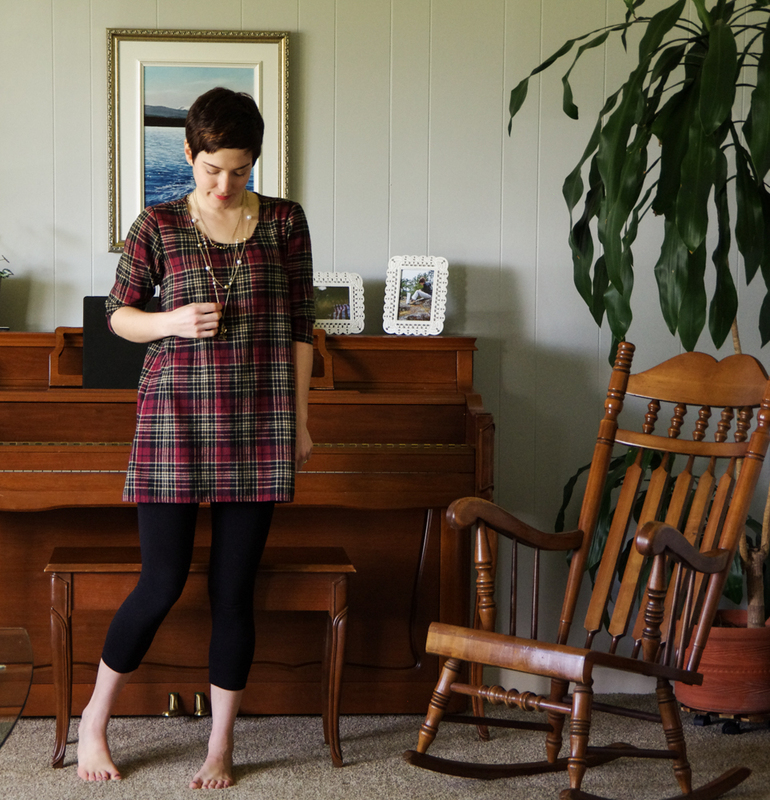 First up is one of two modified Grainline Studio Hemlock Tees – which is an awesome (and free!) pattern, as I am sure you have heard by now! 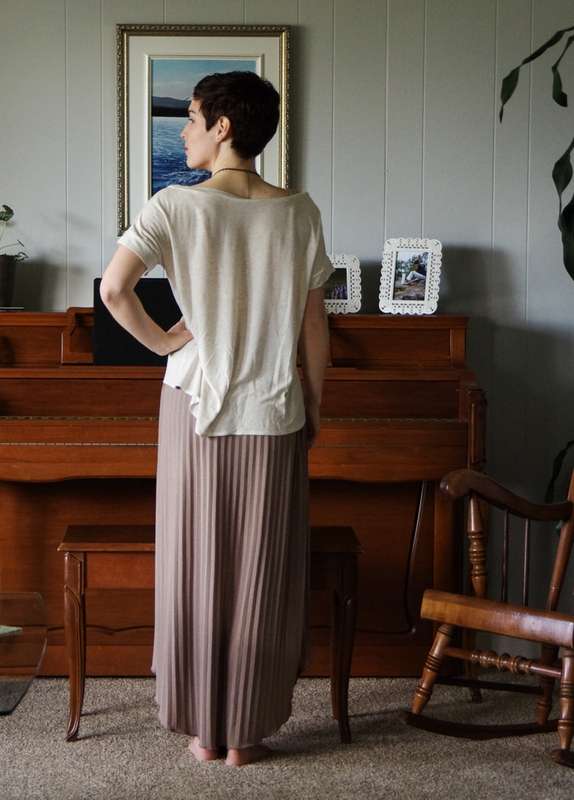 I left off the sleeves, created a HUGE and slouchy neckline and lengthened the body to create a high-low hem. I added a cute little pocket too. Its a bit of a different look for me. Usually I like things that are nipped in at the waist and fairly fitted but I bet it’s going to be super comfy and breezy to wear when it gets hot this summer! 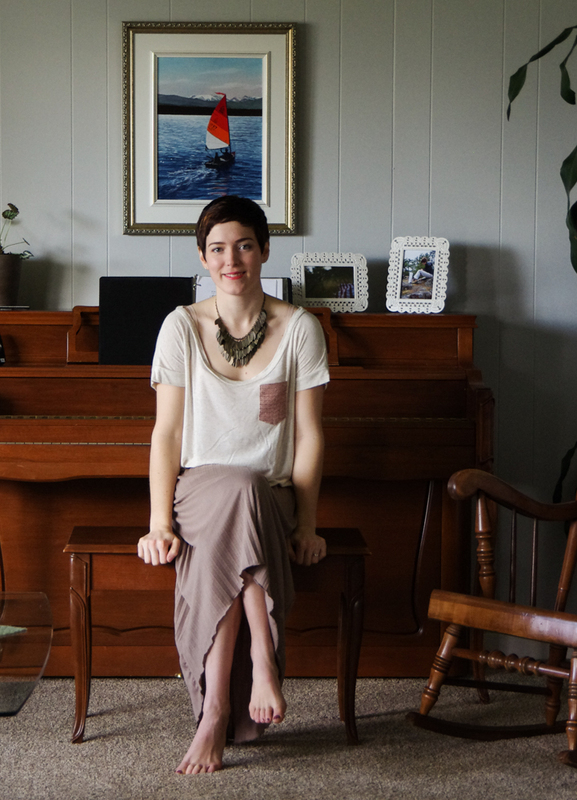 I really admire the aesthetic of Jen’s pattern company and love her writing style and tutorials on her blog. I’ve been on quite the Grainline Studio kick and started with her patterns that are the quickest to sew due to my time constraints. I have not yet got around to sewing two of my favorite patterns of hers: the Archer Button-up Shirt and her Portside Travel Set (which would have been fitting for this trip…darn, if only I had the time!). I lengthened the sleeves on this one and lowered the neckline so it has more of a scooped shape. You can’t see from the photos but I also lengthened the hem on this one though wish I hadn’t in the end because the fabric is a medium-weight t-shirt knit that is very comfy but not especially drapey so the longer and wider hem doesn’t hang overly well. I’ll probably chop it off to Jen’s original intended length before we leave so that it will look good with skinny jeans too. I’m not sure if this outfit is a bit out there…it’s my first attempt at print-mixing. I love the look but tend to find it much easier to dress matchy-matchy. 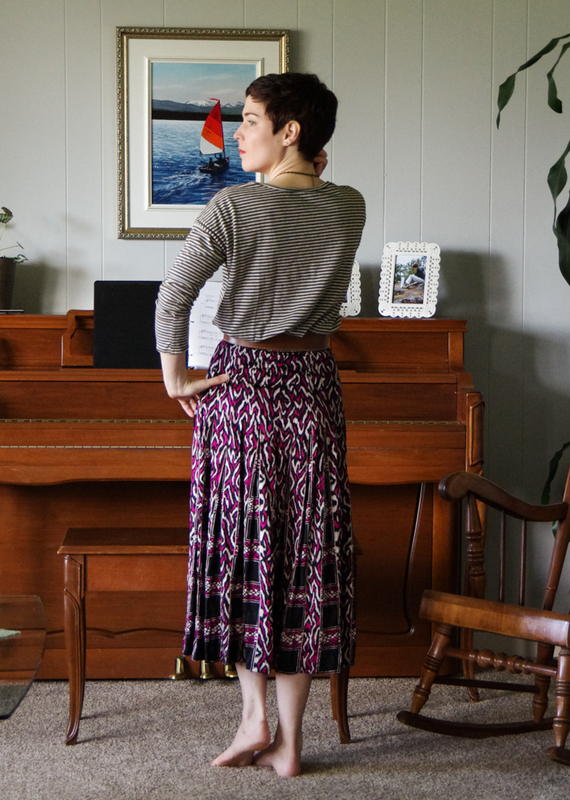 This skirt is my favorite thrifted piece of clothing – it’s silk and has the most dramatic pleating. And, since I’ve been into quick projects, I decided to whip up a dress from my go to dress pattern, the Sewaholic Cambie dress. This is my third Cambie (the first two are here and here) so I thought I would be practised enough to sew it REALLY fast. I would have been able to do so but I got carried away with all sorts of little details…I think due to the months and months of dress-free sewing, when I started getting into the girly details, I couldn’t stop! …and red lace along the blind-stitched hem. 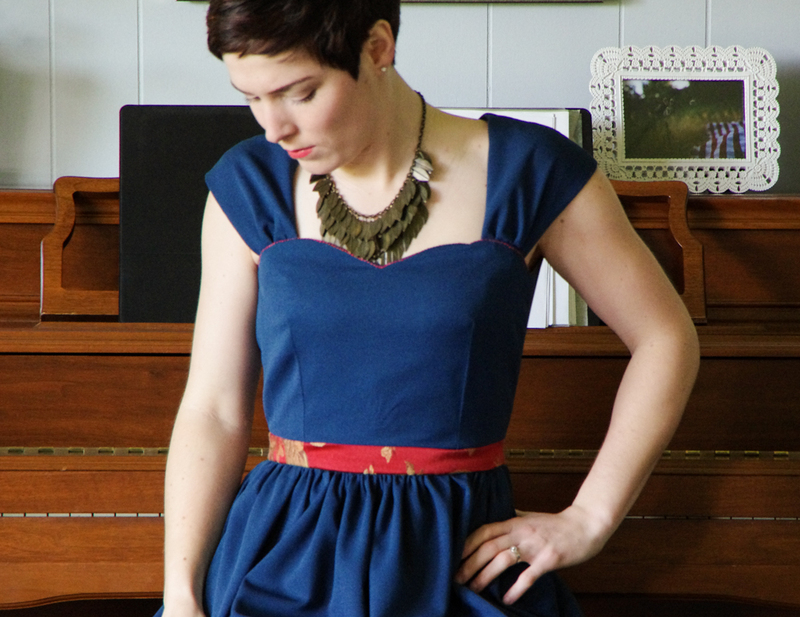 Now back to quick makes – the last one I’ve managed to fit in – I sewed up a Scout Tee dress! Another of the much loved Grainline patterns, this was made using some leftover fabric from a sample for one of our future patterns. Its a really cozy and soft flannel and is one of only two plaid garments I own (I love plaid, I don’t know why I wear it so little!). Here it is photographed without a belt but I almost always wear it either with a belt or with a cardigan done up over top of it to cinch in the waist. Also, I might as well mention the accessories I made to go with my new outfits a couple months ago – some long necklaces! I have all sorts of random jewellery that I keep stuffed in my jewellery box but don’t often wear because I don’t especially like it for one reason or another. I was on the verge of giving it to the second hand store (it’s mostly just costume jewellery) but lots of it has sentimental value so I decided to re-purpose it to make it wearable! 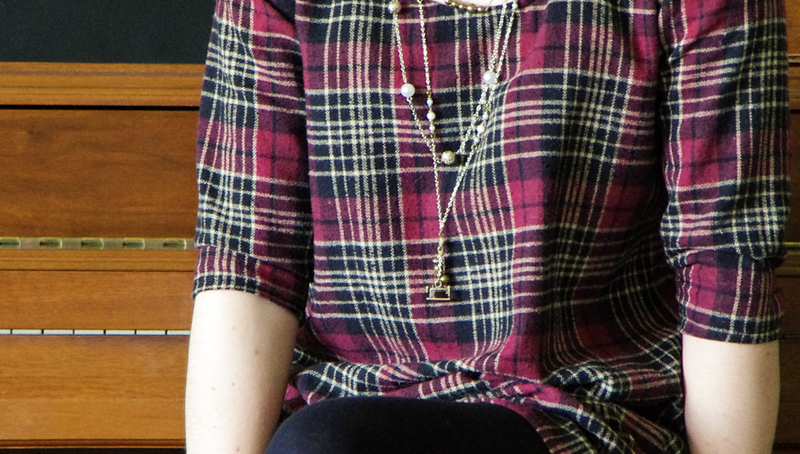 It worked really well – these three necklaces that I have layered in the above photo were originally seven different pieces of unworn jewellery! And isn’t the little sewing machine cute? My local machine repair shop gives out sewing related charms each time you make a purchase :). Later on this weekend I’ll post some photos of the clothes I made for Matt’s travel wardrobe – his are the most important because, of course, they are Thread Theory garments and will likely be examined closely at stockists and on the TV show set! 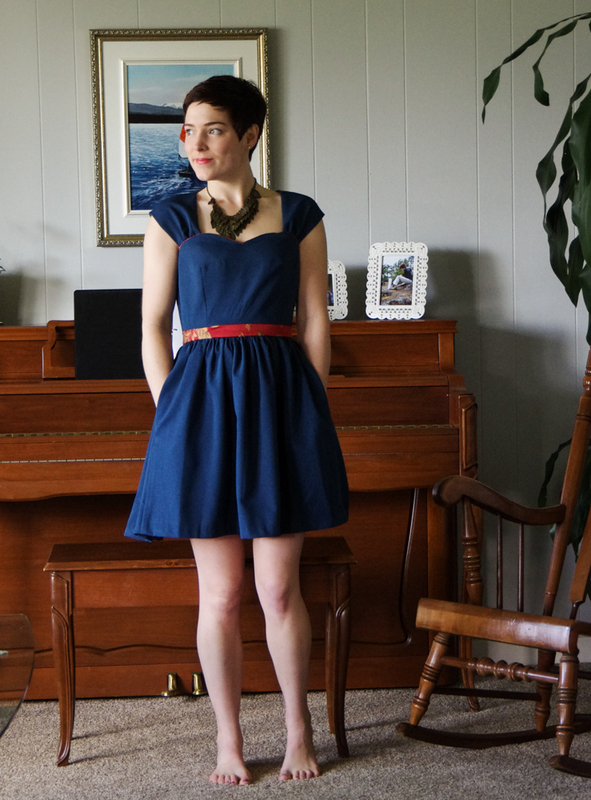 Categories: Friday Posts, Morgan's Sewing Projects | Tags: Grainline, Sewaholic | Permalink. Hi….just discovered your blog; well done! I also agree with others that you have a great hairstyle! The Hemlock T looks really elegant, but how do you keep it from slipping off your shoulders? Re wondering about a top for you lovely thrift store silk skirt find, have you considered crop tops? I can see a sleeveless black linen top with a square cut neckline. Okay, now I have to read all your other posts!!!! Oooh, I love your crop top idea! I have been admiring Tasia of Sewaholic’s recent posts featuring crop tops – I think one fitted crop top like hers and one boxy top (maybe using the Grainline Scout Tee as a base?) would be a great way to make the skirt more wearable in the summer. The striped Hemlock doesn’t slip off my shoulders at all but I haven’t worn the cream coloured Hemlock much at all because it slips off constantly – I think I should add carriers to thread bra straps through to solve this problem (possibly like these: http://dixiediy.blogspot.ca/2013/05/adding-bra-strap-carriers-to-your.html). Your comment has motivated me to finally do so! Thank you! 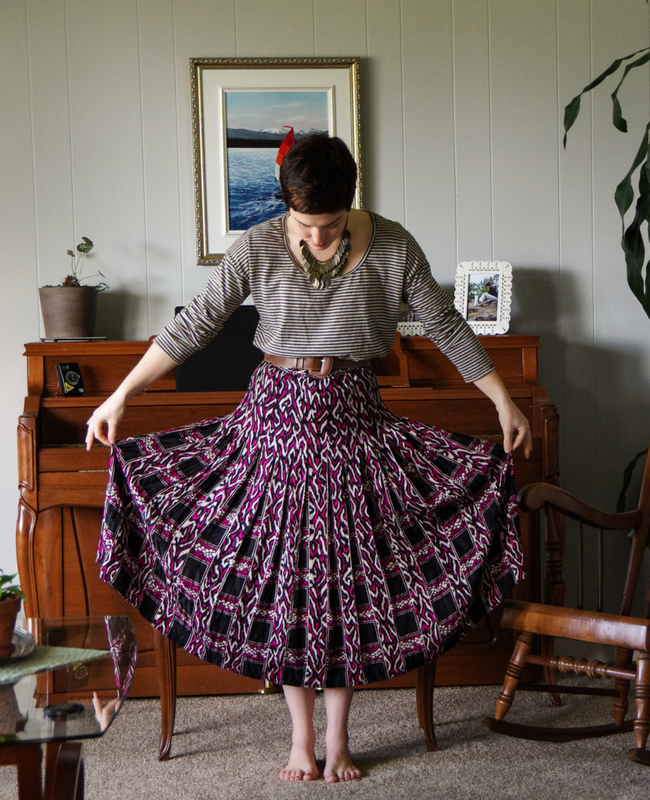 That vintage skirt is beautiful! And I love your Cambie – it looks really nice on you. I love your outfits and your haircut! You look so stylish! Thanks! I just got my hair dyed and cut for the show 🙂 It will help me stay confident despite my camera-shyness I hope! You look stunning so that shouldn’t be a problem! I hope it helps with the confidence! I love the plaid scout, I am not usually a plaid fan, but that dress looks so comfy, like wearing your pyjamas without anyone realising it! these are all great makes! huge grainline studio fangirl right here, i could pretty much live off her patterns. enjoy your upcoming trip! I could live with just them too (in fact, I pretty much will be for our trip :P). They’re great foundations for all sorts of styles. Aww all your outfits are super cute! Have a great trip. I don’t know if you have heard from others, but I am subscribed via rss feed, and everything you post is coming through twice. I can send you screenshots if it would be helpful, but they’re posted at different times. At first I thought maybe you were republishing, but perhaps there is something up with your feed? The patterns will be waiting for you when you’re ready 😛 Good luck saving pennies (I certainly know that struggle well!). 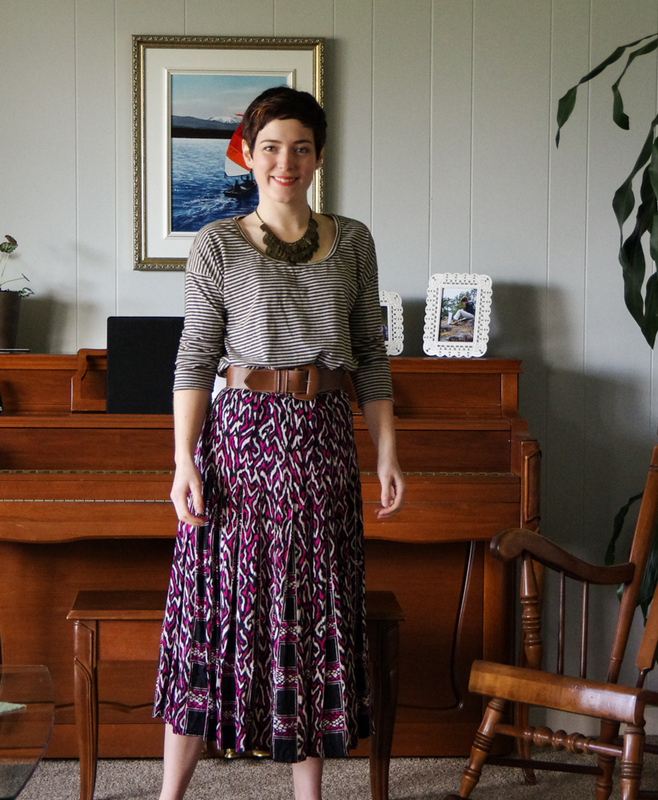 I love seeing your outfits, and I think the print-mixing really works! 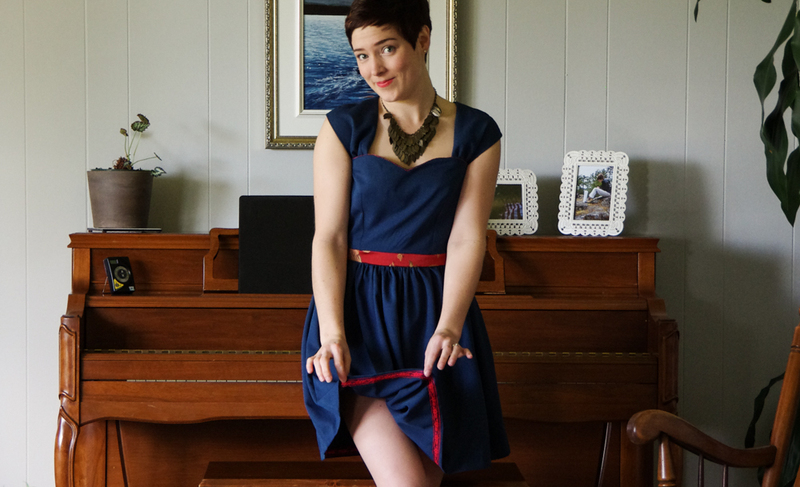 Your Cambie dress is so adorable! I LOVE seeing everything you make for yourself! 🙂 I am envious of your Scout dress, I want one now! It’s really quick to make so you won’t have to be envious for long 🙂 I forgot to mention that I made the arms a little too narrow at the elbow – watch out for that if you plan to extend the arms on yours as it makes it a tiny bit restricting if I don’t push the sleeves up past my elbows.